Explore the notable works of the museum and the different tours, as well as the online catalogue; they’ll help you plan your visit. 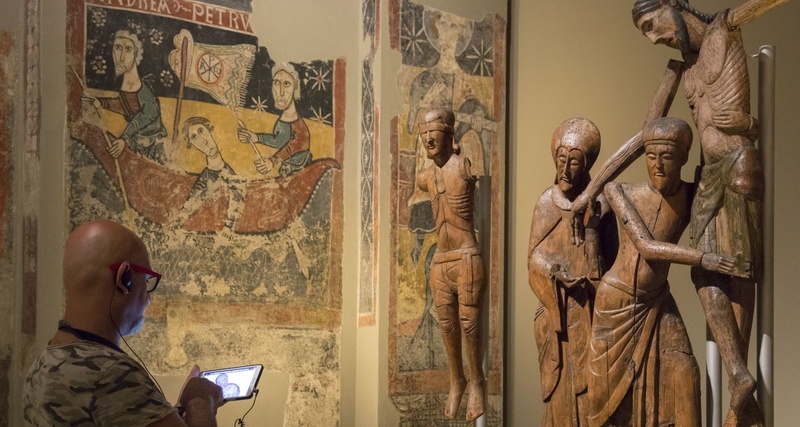 You can consult the temporary exhibitions, the visits and the activities programmed to decide when to visit us, according to your interests and availability. Avirtual tour will give you an idea of the size of the rooms and spaces. The admission tickets can be bought in advance. The museum offers discounts and free-of-charge options and, for groups, we have special conditions. The floorplans included in the user guide, the audio guides and the tours for your mobile will make your visit more self-guided. The museum is spread over two floors where you will find the rooms of the collection. Before starting your visit, we recommend that you take into account the time you have available and that you choose from the offer of guided visits and the different tours we propose. Tired? Why not take a break in the café or the restaurant. Going up to the Rooftop Viewpoint is the perfect complement to the visit to enjoy the panoramic views of the city. Would you like to share the museum experience with others? Recommend the visit to your friends or to other users and comment on your activity or share your photos. Your relation with the museum doesn’t end here: Check out the advantages of being a Friend of the museum. You can follow the programming and the latest news from outside the museum by subscribing to the e-newsletter.